Ivy the Kiwi? is a Nintendo DS game in the Action genre. The game was published by Xseed Games and developed by Prope. The game has an ESRB Rating of E (Everyone 6+) and was released on 2010-08-24. The game's official site can be found at www.ivythekiwi.com. This is the latest offering from famous Sega mastermind and creater of Sonic the Hedgehog Yuji Naka. 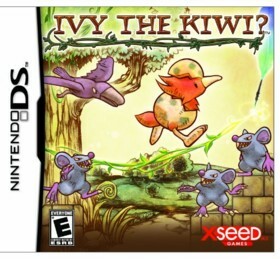 It is a charming action/platformer combined with a puzzle game in which you guide a Kiwi named IVY through various level. This is done by utilizing the stylus to draw vines across the screen to guide IVY to the goal. The game features about 100 levels and you need to plan Kiwis route carefully as you are only allowed to draw a certain amount of vine at a time. You can manipulate the vine in various ways and shapes, and you can use the vine as a trampoline to launch IVY up to higher ground. All in all this game is quite fun, the sound, music and graphics are all very well done and the levels provide countless replayability. I really enjoyed this game and recommend it for either quick gameplay sessions or long gaming sessions on the road.